Numerous objects that we have used in the past decades have completely disappeared and a number of them have been eclipsed and replaced by new objects. Contemporary homes look very different from vintage homes, not just in terms of design but also in terms of components. First and foremost, technology today is remarkably different. Improvements in design have occurred in tandem with the improvements in technology in this digital era, so a lot of large vintage home gadgets have been redesigned and scaled down into startlingly smaller sizes. While millennials may very well laugh at the thought that anyone ever used these objects, the fact is that they used to be in every house until the late 90s. If you are 25 or older, you will most probably recognize many of them. So without further ado, let’s take a trip down memory lane and take a look on 5 vintage home gadgets that you will never see in contemporary homes. Many millennials have probably never even seen one! 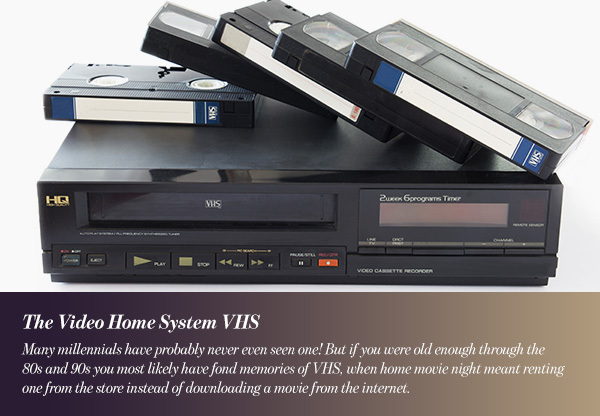 But if you were old enough through the 80s and 90s you most likely have fond memories of VHS, when home movie night meant renting one from the store instead of downloading a movie from the internet. The Video Home System, known as VHS is consumer-level analog video recording on tape cassettes. The technology was developed by Victor Company of Japan (JVC); it was released in Japan in 1976 and in the rest of the world in 1977. Through the 1980s and the early 1990s, VHS dominated the home entertainment sector. It was a staple in almost every house during that era. However, more advance technologies began to take its place by the mid-1990s, such as laser discs and DVDs, up until these too began to disappear. The last known company in the world to manufacture VHS equipment was Funai Company in Japan. And even this company ceased production of VHS equipment in July 2016. For anyone born anytime from the mid-70s to the early 90s, the stereo system was a rite of passage. The CD player, tape deck and speakers, and of course the accompanying complex wire system that always got tangled. The first audio cassette tapes were invented by Philips in 1963 and marketed as portable dictation machines. They were used by journalists and reporters. By the early 70s, cassette tapes took over older home audio systems, they were lighter, easier to carry, easier to fast forward or rewind and produced sounds of much better quality. Cassette decks soon came into widespread use and were designed variously for home audio systems, cars and portable recorders. From the mid-70s to the late 90s the cassette deck was the preferred music source for almost everyone. Cassette deck sales were expected to fall down with the introduction of the compact disc. However, the presumed transition did not happen and CDs and cassettes co-existed for almost 20 years. Of course that came to an end with the mp3 era! 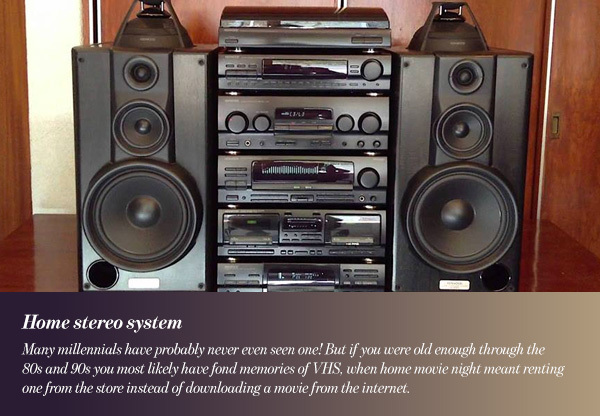 You will probably never see home stereo systems in contemporary homes, but they were an essential in each and every vintage home up until the early 2000s. 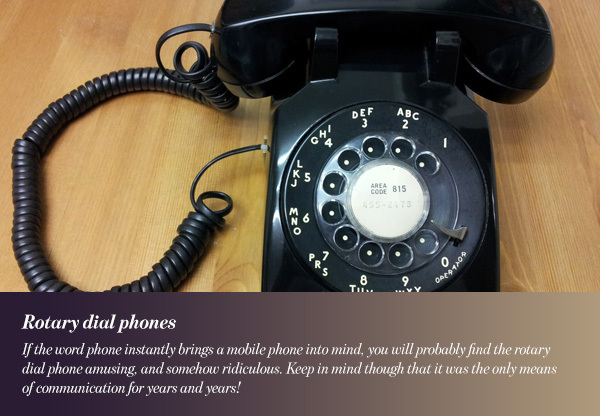 If the word phone instantly brings a mobile phone into mind, you will probably find the rotary dial phone amusing, and somehow ridiculous. Keep in mind though that it was the only means of communication for years and years! From 1919, when rotary dial phones first became available for home use, to 1980 when tone dial was invented people relied on rotary dial phones to communicate. They were an integral home appliance, and often times garnered a special corner or nook with the appropriate décor. The rotary dial phone may never be seen in contemporary homes, unless as an antique of course, but these charming phones were commonly used until the early 90s. It is highly unlikely that millennials have ever seen an antenna in their contemporary homes; nonetheless, they were a necessity with every TV until the early 90s. A television antenna, or a TV aerial, is a gadget which was specifically designed to receive over-the-air broadcast television signals. 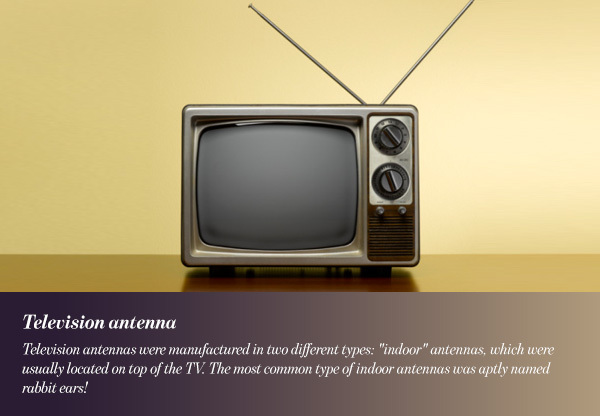 Television antennas were manufactured in two different types: “indoor” antennas, which were usually located on top of the TV. The most common type of indoor antennas was aptly named rabbit ears! On the other hand, outdoor antennas, which were usually situated atop a mast on top of the house or in the balcony, were more expensive and more difficult to set up, but provided better reception. Before the satellite dish and cable TV were as popular and widespread as they are today, all homes had television antennas, both indoor and outdoor. Remember when you had to set your alarm every night before going to bed? No? You are too young then! 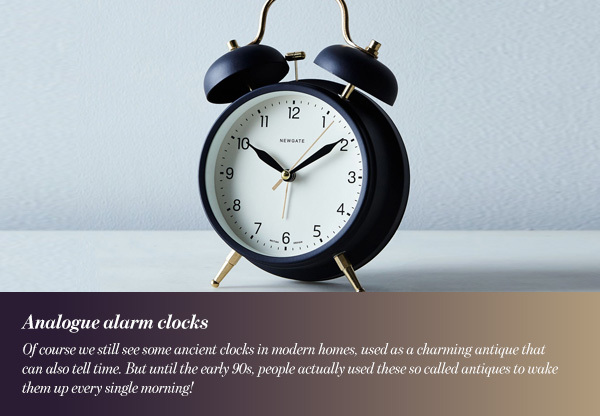 Of course we still see some ancient clocks in modern homes, used as a charming antique that can also tell time. But until the early 90s, people actually used these so called antiques to wake them up every single morning! The most common design for analogue alarm clocks features a couple of metal bells and a small hammer between those bells. When the alarm goes off the hammer strikes the bells to produce the ridiculously loud sound which wakens the sleeper (and the neighbors in some cases). This beautiful and useful gadget was replaced by the digital alarm clock in the mid-90s, before they were both annihilated by our dear smart phones that wake us up among other tasks. Want to upgrade to smart home technology? Here’s how!